09/14/18 | Insights from HIRUMA first hand — Dai Ichi Arts, Ltd.
Wow! Hiruma San visited the gallery from Japan! Even though she missed the opening night due to extreme weather back home, she made a great effort...changing airports and airlines to meet her new fans in NYC. Hiruma's surprising arrival gave us the opportunity to talk to her and learn from her first hand. Works such as Trail of Wind (2014) and Midnight Sun Boat III (2011) demonstrate how the artist draws inspiration from nature. Hiruma shared how visiting New Zealand inspired her deeply and moved her to make a new body of works. Her formal language began to express forms such as boats docking on the beach and bird-eye views of islands. When Hiruma participated in exhibitions outside of Japan, people often commented on her work's masculine and powerful qualities. For her, however, the painstaking process of putting layers and layers of sheets of clay together makes her work decidedly feminine. Her works are balanced, evincing power while remaining contained. Her works are a technical marvel. It takes Hiruma nearly two-three months to finish a piece. After she layered her work, she will allow time for it to naturally dry, then she bisque fires each work. The sculptures have a slip containing cobalt, iron, copper and magnesium elements that are already mixed into her clay. Hiruma coats these element-filled slips with a white glaze, which makes pink, purple, blue and gray emerge after firing. She also adds a pubbling glaze, which causes the orange peel effect. Last but not least, Hiruma applies silver and pearl overglazes to the piece before lower firing them. Her lengthy, fastidious process is not lost on the viewer when enjoying one of these intricate sculptures. 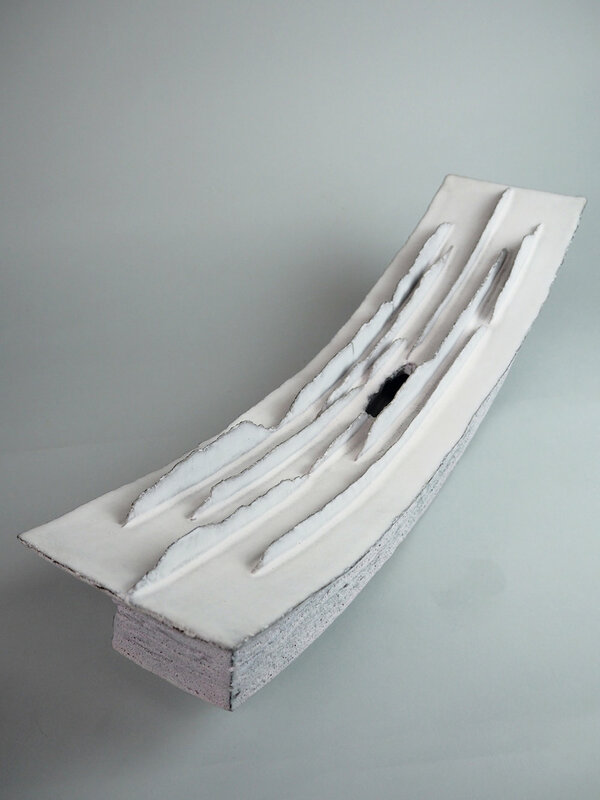 Each of Hiruma's works is tactile and detail oriented. For her, it is a process of timing. She prepares each single sheet of clay and stacks them on top of each other, letting future viewers feel the fleeing of time.